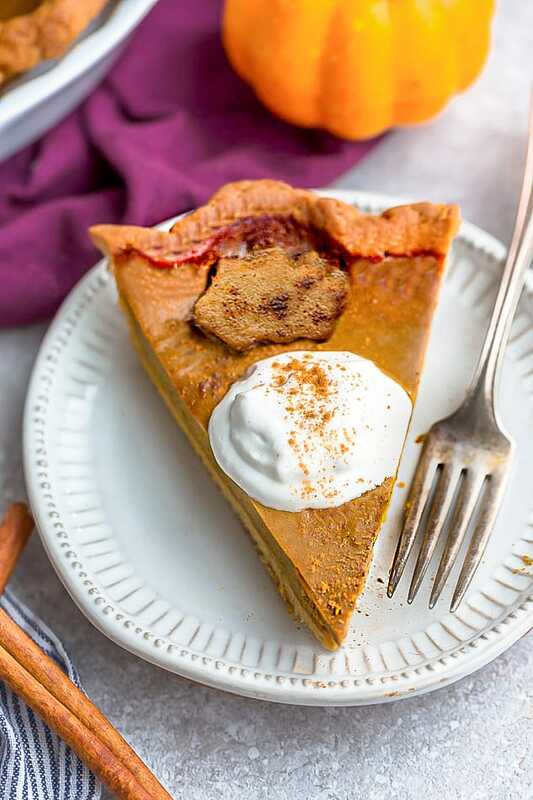 Keto Pumpkin Pie – A delicious low carb and paleo pumpkin pie recipe with all the classic flavors of a traditional pumpkin pie. 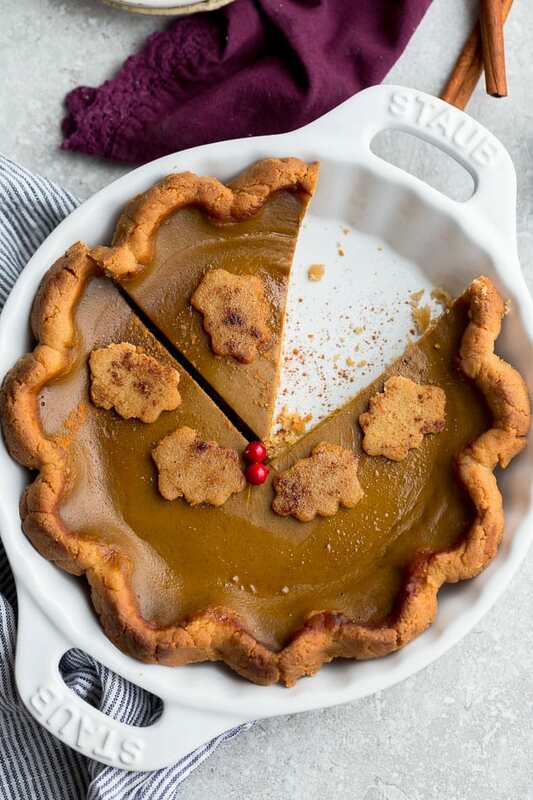 Made with a flaky and buttery crust with a creamy and smooth custard filling with cozy fall spices perfect for the holidays. When it comes to classic North American desserts, Pecan Pie and Pumpkin Pie is always a popular choice. It’s a year round favorite but especially during fall and winter holidays like Thanksgiving, Halloween and Christmas. My husband and stepdad are absolutely crazy about pumpkin pie it’s a must at our holiday table for Thanksgiving and Christmas every year. This keto pumpkin pie recipe has been in the works for a long time coming. It’s has a flaky pie crust with a deliciously creamy and perfectly spiced paleo-friendly custard filling. 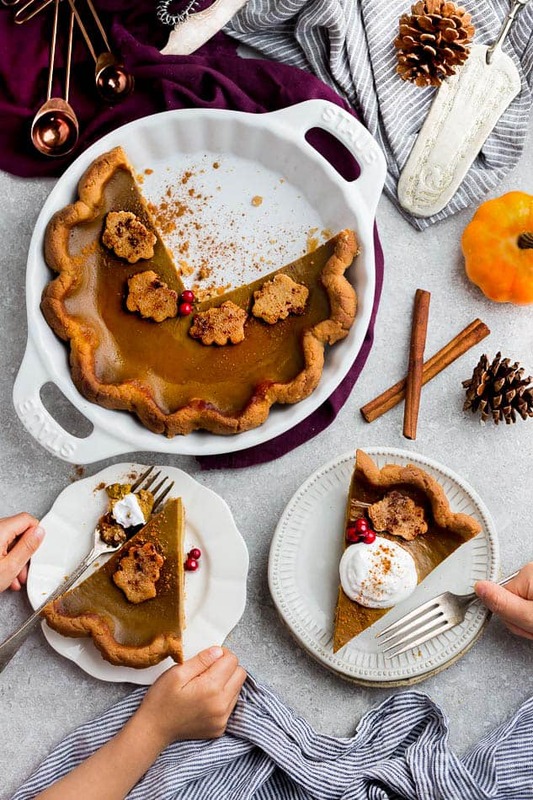 It ticks off all the boxes of what the perfect pumpkin pie should be for my picky family. It’s incredibly delicious, completely dairy free, sugar free and gluten free and fits into a low carb, paleo & ketogenic diet. 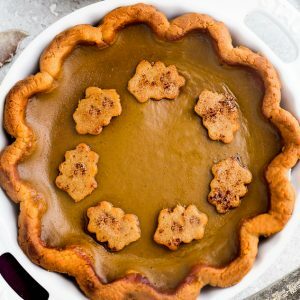 WHAT INGREDIENTS DO I NEED TO MAKE KETO PUMPKIN PIE? 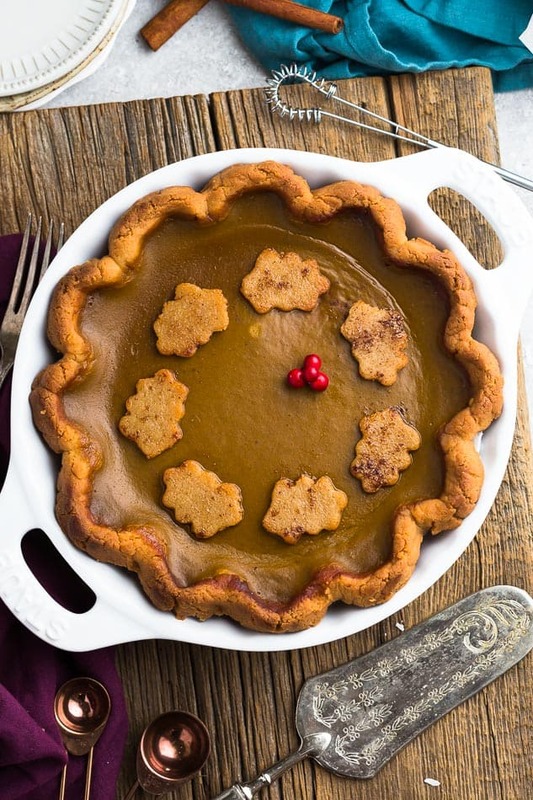 The crust for this pumpkin pie is made with a blend of blanched almond flour and coconut flour, which I find create a nice and light texture. 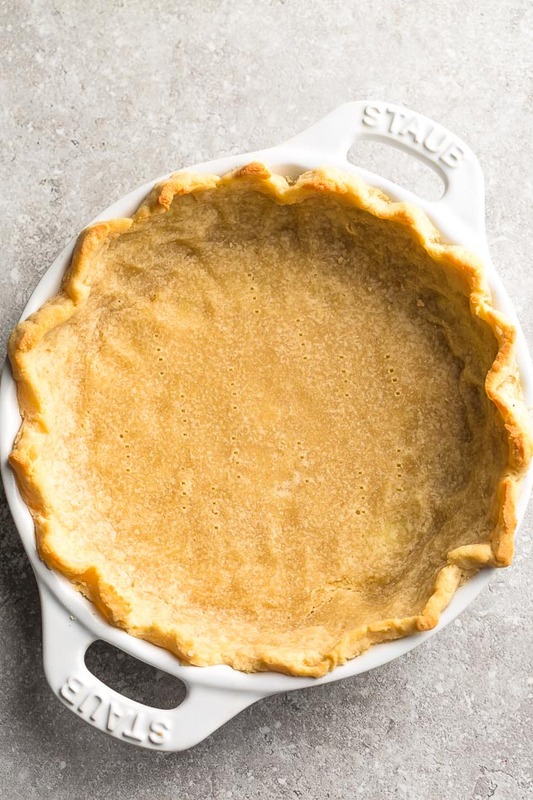 For a flaky yet buttery crust, we use a blend of grass-fed butter (use butter-flavored ghee for true Paleo) and coconut oil while the egg help to bind it together. I also like to add a pinch of salt along with powdered monk fruit for some flavor and sweetness. Leave out the sweetener if you plan on using the crust for savory pies. For the deliciously smooth and creamy custard filling, you’re going to blend all the ingredients in a blender until nice and creamy. 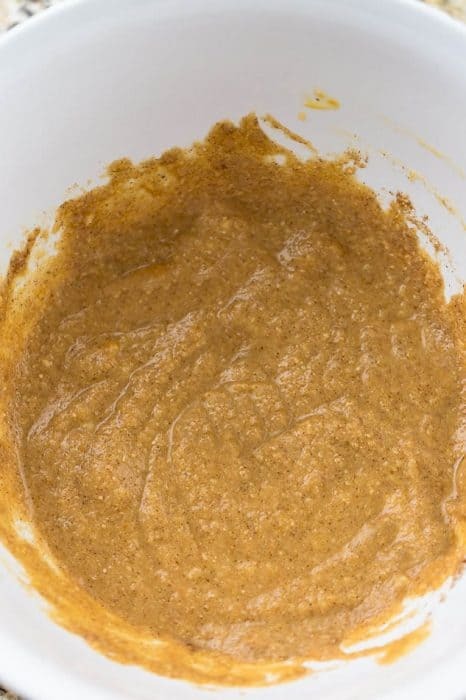 It’s a mixture of organic pumpkin puree, 2 eggs, coconut cream, pumpkin seed butter (or sub with almond butter), pure vanilla extract, powdered monk fruit, pumpkin pie spice, cinnamon and salt. An important thing to remember if you’re using canned pumpkin is do not buy the pumpkin pie filling. 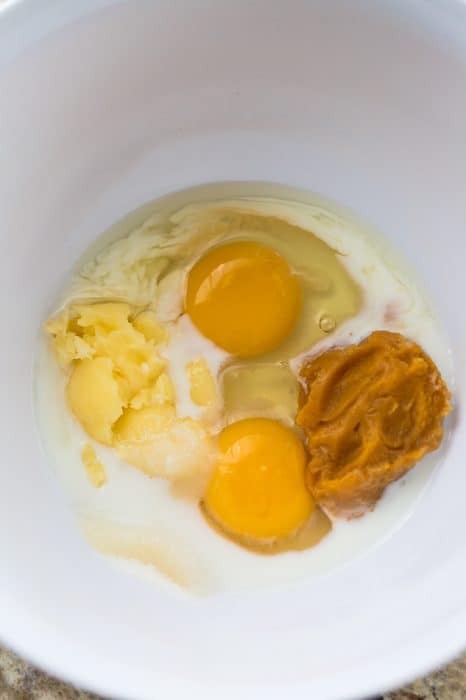 Also make sure your eggs are at room temperature in order for your custard to blend evenly with the rest of the ingredients. 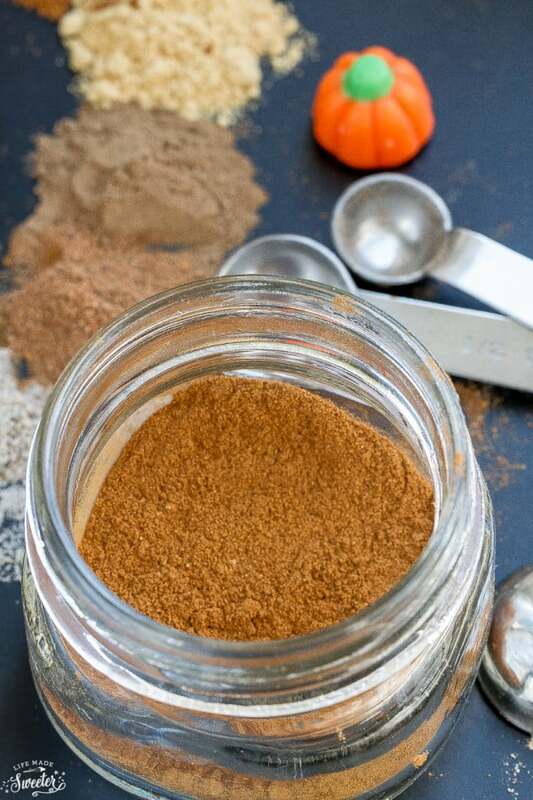 If you don’t have pumpkin pie spice, it’s really easy to make your own with a blend of cinnamon, nutmeg, ginger, allspice, cloves and mace. 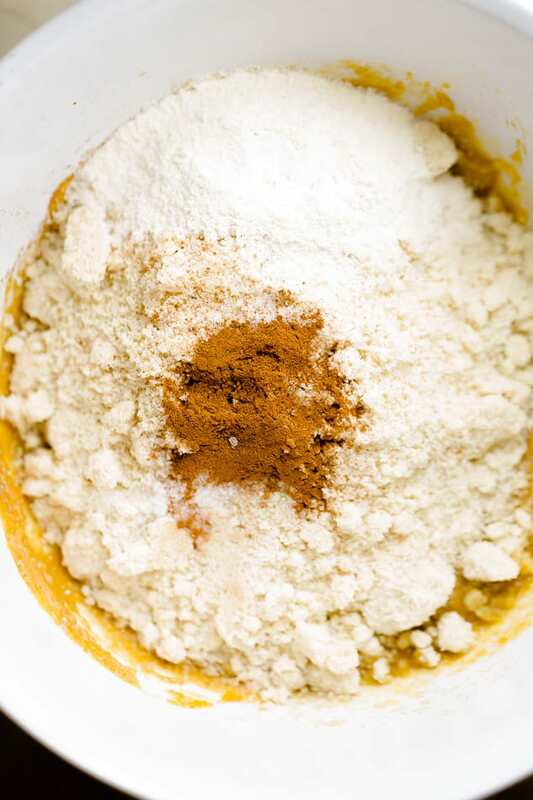 Combine the almond flour, coconut flour, powdered monk fruit, salt, butter (or ghee) and coconut oil in a food processor and pulse / process until the texture resembles thick coarse crumbs. Add the egg, then pulse again, until dough forms and comes together. Gather the dough into a ball and wrap in plastic wrap. Chill dough ball in refrigerator for at least 15 minutes or up to 2 days. 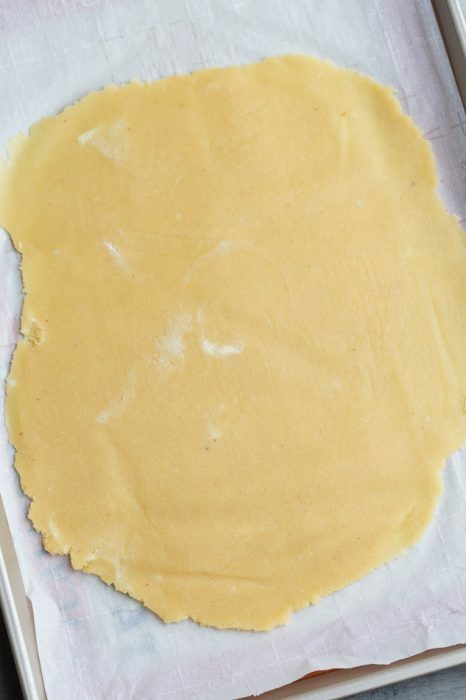 Once the dough is ready, roll between two sheets of parchment paper into a large circle big enough to cover a regular 9-inch pie dish. Lay over the pie dish and press into the bottom and the sides of the pan. Trim & flute edges and use any leftovers for cutting out festive shapes, if desired. Carefully pierce holes in the surface using a fork to prevent bubbling and place the pan in the freezer while you preheat the oven and you’re ready to prepare the filling. Preheat the oven to 375°F. Remove the pie pan from the refrigerator and par-bake the crust for 8 minutes or until very light golden brown around the edges. Add all the ingredients for the filling and blend until smooth and combined. Pour and spread the filling into the par-baked pie crust. Cover the crust edges with a pie shield or aluminum foil to prevent burning. Bake for 35-45 minutes or until center is nearly set (still a bit jiggly) and crust is deep golden brown. Allow to cool completely at room temperature for at least 2 hours. Top with coconut whipped cream and a sprinkle of cinnamon, if desired. If making ahead, wrap and store in the refrigerator for up to 2 days. CAN I USE ANOTHER SWEETENER? Monk fruit sweetener is my preferred low carb sweetener of choice and the one I used to test out this recipe. You can certainly try using powdered erythritol or Swerve if that’s what you like or have on hand but you may have to adjust the amount to suit your taste. If you want a paleo sweetener, you can try switching out the powdered monk fruit with coconut sugar or maple syrup and adjust amount to your liking. 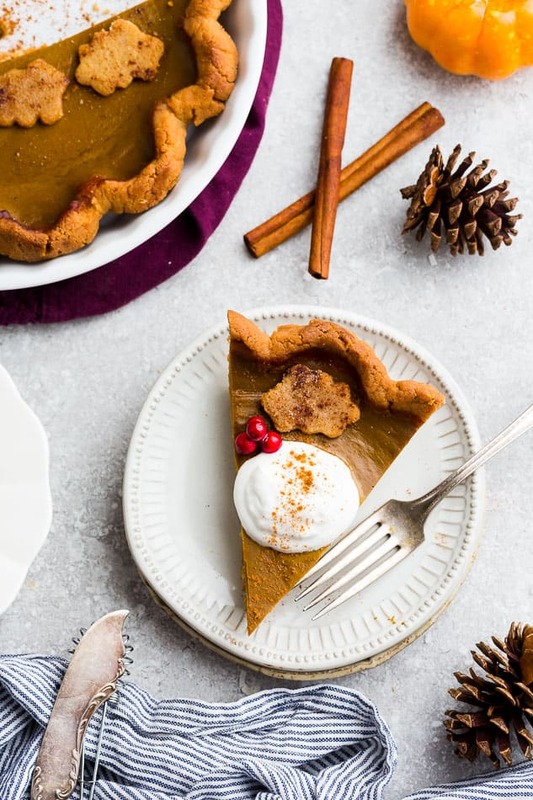 Keto Pumpkin Pie - A delicious low carb pumpkin pie recipe with all the delicious flavors of a traditional pumpkin pie. 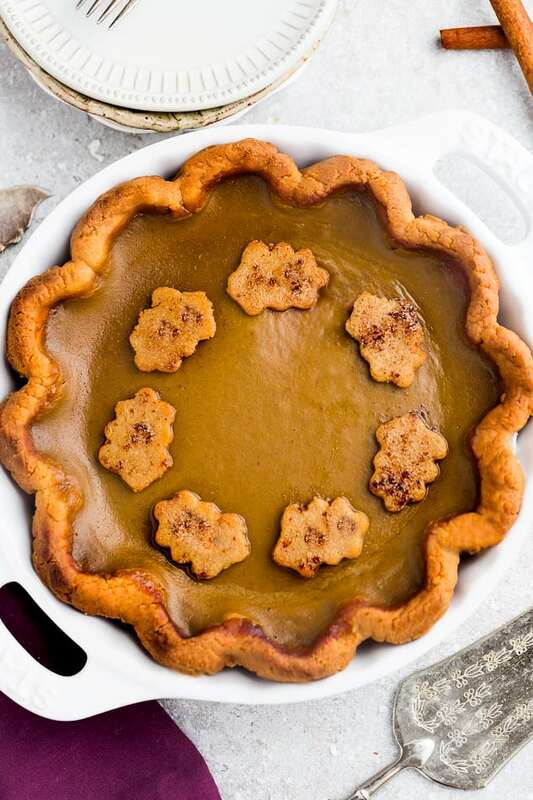 Made with a flaky and buttery crust with a smooth and creamy Paleo-friendly custard filling with cozy fall spices. Combine almond flour, coconut flour, powdered monk fruit, salt, butter and coconut oil in a food processor and pulse / process until large pea sized crumbs appear. Add the egg, then pulse again, until dough forms and comes together. 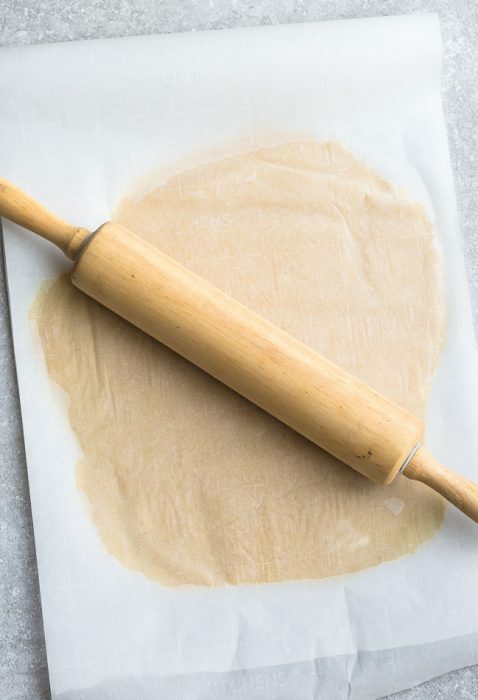 Add more flour (1-2 tablespoons at a time) as needed, if pie dough seems too sticky. Gather the dough into a ball and wrap in plastic wrap. Chill dough ball in refrigerator for at least 15 minutes, or up to 2 days. Lay over the pie dish and press into the bottom and the sides of the pan. Trim & flute edges and use any leftovers for cutting out festive shapes, if desired. Carefully pierce holes in the surface using a fork to prevent bubbling and place the pan in the freezer while you preheat the oven and you're ready to prepare the filling. Preheat the oven to 375°F. Remove the pie pan from the refrigerator and par-bake the crust for 8-12 minutes or until very light golden brown around the edges. Add all the ingredients for the filling into a blender and blend until smooth and combined. Pour and spread the filling into the par-baked pie crust.